The most common whine with Windows systems is that users report that it gets very slow at times. Other than that it hangs or freezes a lot. Windows 10 is much better than its predecessors in this matter, but still has a long way to go. Whenever we face a situation in which the system is hanging or freezing, the first thing to be checked is the disk utilization in Task manager. Most probably, it would be nearing 100%. This means that the RAM of the computer is being overutilized for some reason. Check the process which is causing high disk utilization in the Task manager. If the process is WUDFHost.exe, we could use this troubleshooting guide to fix the issue. WUDFHost.exe stands for Windows User Driver Framework Host. First brought up in Windows Vista, the process is used to provide better stability to external devices like sensors, MTP devices, portable devices, etc. Just like every process in the Task Manager, the WUDFHost.exe process is also triggered by an action. Here the action is whenever an external device which is dependant on the process is connected to the system. If that device is in use, even the more reason. Since the device would most probably be a peripheral, try disconnecting all the external devices other than those which are critically necessary (eg. keyboard, mouse, etc). Now reconnect each device one by one and check which one causes the disk utilization to shoot up. It may happen that despite disconnecting all the devices, the disk utilization still remains high. If you are using a Windows 10 system, the ideal RAM would be 4GB instead of the recommended 2GB. 2GB of RAM would slow down the system and cause such issues. Thus, it is highly recommended to increase the RAM. If we find any specific device which is causing the issue in solution 1, instead of disconnecting it forever or replacing it, we could first try updating its drivers. Here’s the procedure to update drivers. 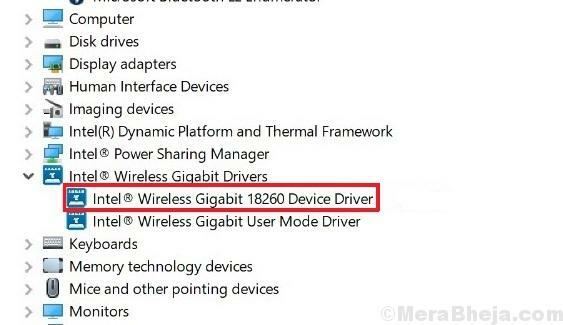 2] In the Network adapters section, find the Intel Wireless Gigabit 17265 User mode driver. 3] Right-click on it and select Disable device.